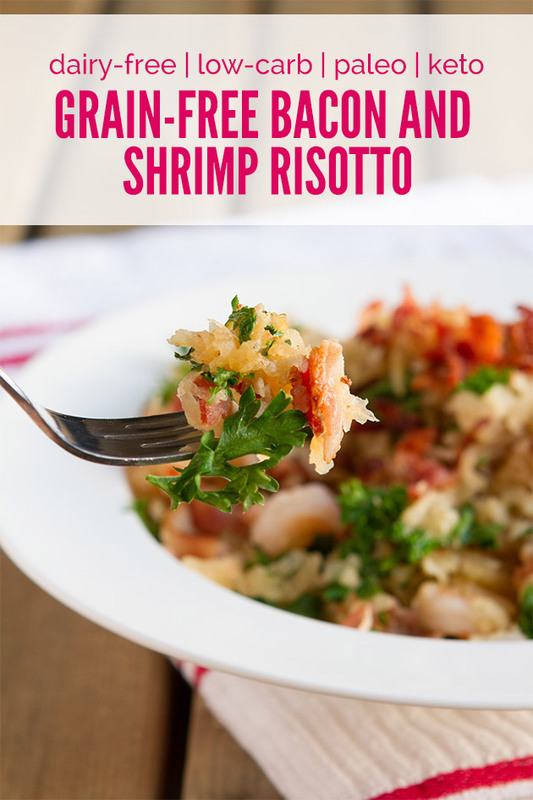 A light keto risotto made grain-free and keto with shredded daikon, a mild radish that acts similarly to rice when cooked. Topped with crispy keto bacon and fresh parsley. Maybe you’ve made keto cauliflower rice before? Well, let me introduce you to the concept of shredding daikon and using it as a keto replacement for rice in your favorite risotto recipes. Daikon (also known as Lo) is a mild winter radish characterized by its long shape and white root. The thinner roots are sweeter than the large thick roots, the thick roots being a bit spicier. You can eat keto-friendly daikon raw, or cooked. There’s an awesome keto recipe in Fat Fueled for keto “Doodles”, daikon spiralized into noodle form and coated with oils and spices. If you cannot find daikon at your local grocery store, other keto veggies like jicama or cauliflower would also work fabulously for this keto recipe. Notes in the keto recipe, also, if you are sensitive to shrimp and need to substitute. Enjoy! 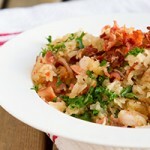 A light low-carb, keto risotto with shredded daikon, a mild radish that acts similarly to rice when cooked. Topped with crispy keto bacon and fresh parsley. 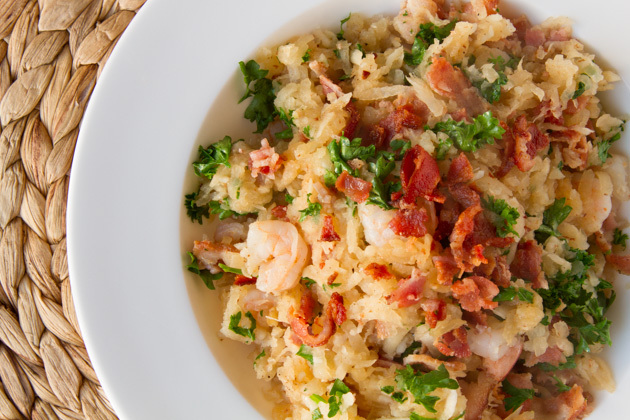 Shrimp: if you are sensitive to shrimp, feel free to replace with extra bacon or pieces of cooked chicken thigh in this keto recipe. 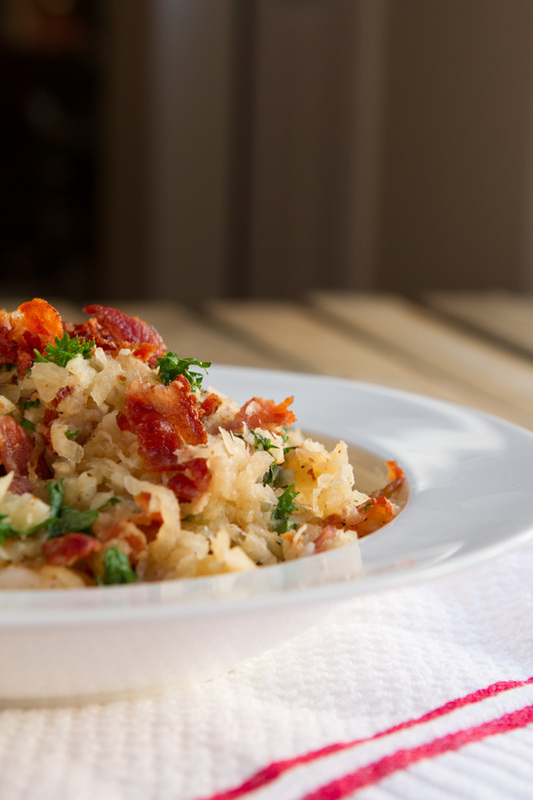 How much extra bacon would you put on your keto risotto? Honesty time? I made an extra 3 strips of keto bacon goodness and crumbled them overtop before enjoying my keto portion!